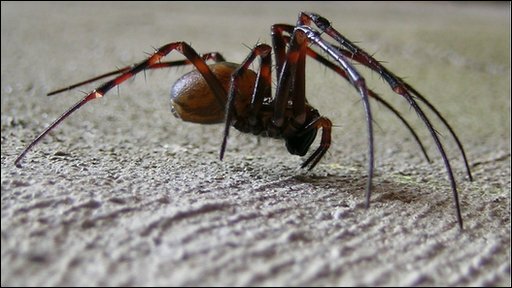 Special features: There are two large brown coloured cave spiders found in the U.K.; Meta menardi and Meta bourneti. The two can only be distinguished by examining them with a strong magnifier. They are amongst the largest spiders found in the U.K. Both species live in total darkness, so although they are not rare, they often go unnoticed. The female cave spiders produce teardrop-shaped eggsacs, which hang suspended on a silk thread from the roof of their dwelling. When the spiderlings first emerge they are attracted to light, unlike the adults which are strongly repelled by light. This helps the spiderlings find new areas to colonise.